I made these little bites for my aunt's pool party on Memorial Day weekend. Bob has loved prosciutto and melon ever since the first time he tried it many years ago. 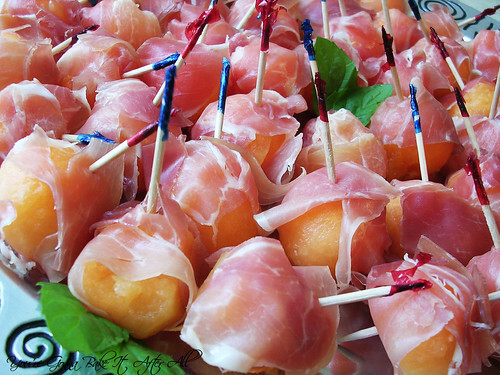 He loves the combination of the sweet melon and the salty prosciutto. Since I won't eat any meat other than poultry, I didn't try them, but Bob was really happy with how they turned out. 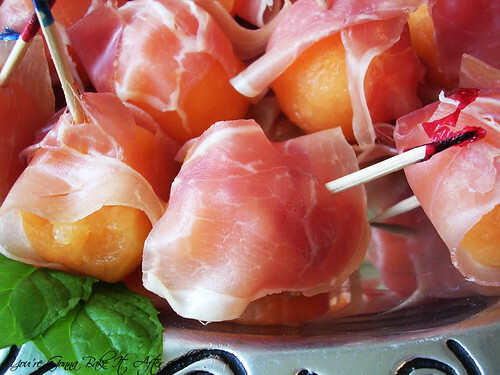 These are an easy appetizer for outdoor barbecues and picnics! 1. Cut each slice of prosciutto crosswise into four strips. 2. Trim about 1/2-inch off the top and bottom of the melon to reveal the inner fruit and create a flat surface. 3. Stand the melon on one of the sliced, flat ends. Following the natural round shape of the melon, use a very sharp knife to remove the skin, turning the melon as you make each cut. Make sure your cuts are deep enough to cut beneath the rind and expose the vibrantly colored flesh, but be careful not to cut off too much of the fruit. Do not cut the melon in half. 4. Using a melon baller or small cookie scoop, press firmly into the flesh to create an indentation; twist in an even, clockwise motion to scoop out a round ball. Cutting as closely as possible, continue making balls until all that is left is a large melon "wiffle ball." You will have more melon balls than are needed for the canapes. 5. 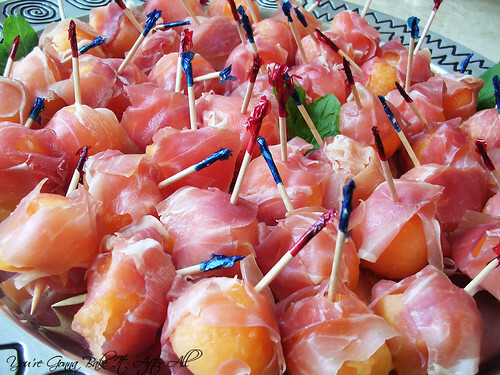 Take a piece of of sliced prosciutto and wrap it around a melon ball. Secure with a wooden toothpick. Arrange on a platter. Repeat with the remaining melon balls. Garnish platter with mint or basil leaves, if desired. Ooo these would be great at my 4th of July celebration--thanks! Salty & Sweet...hard the beat! These look so easy and cute!